FORT INDIANTOWN GAP, PA — Marines with 6th Engineer Support Battalion, 4th Marine Logistics Group, are partnering with the engineers of 131 Commando Squadron, British Army, to participate in exercise Red Dagger at Fort Indiantown Gap (FTIG), Pennsylvania, May 12-25, 2016. The Reserve Marines supporting this fifth iteration of training are based out of five locations: Portland, Oregon, Battle Creek, Michigan, Peoria, Illinois, Folsom, Pennsylvania, and Millington, Tennessee. Fort Indiantown Gap is an ideal training environment as it provides the Marines and British commandos a perfect area to enhance their skills. 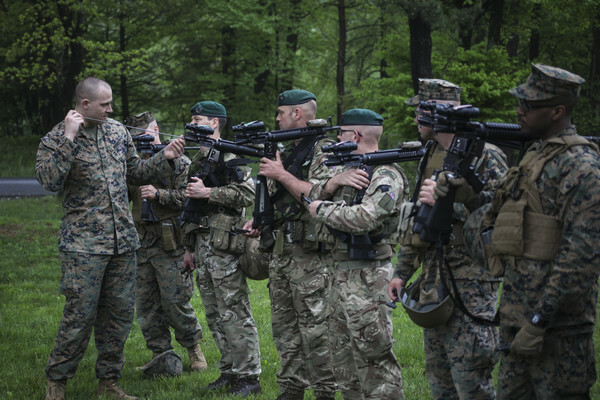 The Marines and British commando’s have plans to conduct combat pistol training, offensive and defensive military operations on urbanized terrain, or MOUT, and a series of vertical and horizontal engineering and welding projects. The first half of the two week exercise will consist of a series of ranges and tactical instruction. While integrating the Marines and British commando’s into four platoons, they will give all junior ranking officers a chance to be involved and lead the platoons. Even though the troops do not share the same procedures, equipment, and tactics, they are able to build off of each other’s knowledge and gain respect for each other’s strengths. Half of the training that will be conducted will give the engineers and metal workers a chance to do something within the realm of their occupational specialty. “The second half of this exercise is the engineering projects, where we will be putting up vertical siding construction pieces and installing new flooring in an old World War II barracks,” said McGovney. “We also have plans for our heavy equipment operators to dig trenches at a local range, in order to practice survivability positions within a tactical environment. The British Commando’s are more than ready to continue this interoperability between the Marines and look forward to learning how to use the Marines weapons, equipment, and tactics. With a hopeful outcome for this exercise and future iterations, the Marines with 6th ESB hit the ground running and kick off the integrated training with the British commando’s.